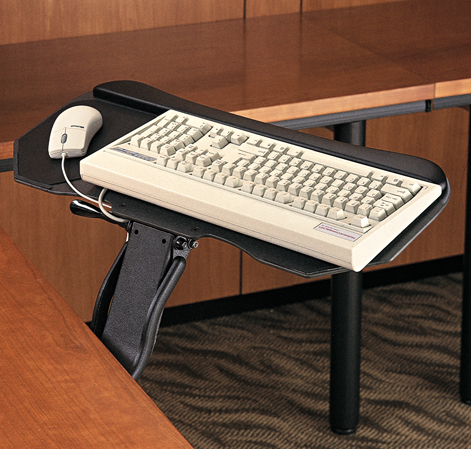 The Cobra arm is our flagship keyboarding product which offers a unique blend of features and capabilities that is unmatched in the world of keyboarding ergonomics. With its superior upward and downward range it will suit virtually all users, regardless of stature, in a seated posture. Its entire height range can be accessed within immediate proximity to the main work surface which is very uncommon among its competitors however incredibly valuable to the user. The enhanced upward range will even allow users of some statures to bring their keyboard and mouse to a functional standing height for even greater working posture variability. Easy to use “dial-in” dynamic tilt and unparalleled stability makes the Cobra a favourite for the most intensive and discerning of users. With the addition of the Mini Cobra and its compact size with height and tilt indicators and the further addition of the Basic Cobra and its excellent value proposition the Cobra family of products is now the most well rounded in our industry. All the range and posture possibilities of the Mini Cobra at a super attractive price.